Cherrie relaxes in the Cabin on the Ridge overlooking Wears Valley. After leaving Maryland we headed south for Tennessee. It was a long drive, but it was also very scenic. The leafs are just starting to change colors, and Cherrie liked that a lot. After a lovely drive through Maryland and Virginia we arrived at our wheelchair-accessible cabin in Sevierville, Tennessee. The address is a bit deceiving, as it’s not exactly in a big city, but on a ridge overlooking Wears Valley. 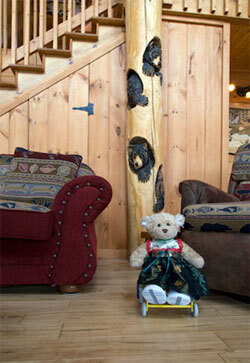 It’s very nicely decorated, and Cherrie felt right at home with all of the bear carvings. We all had a fun time exploring the area. Our first stop was at the Great Smoky Mountain Heritage Center, which features artifacts from the folks who previously lived in the Great Smoky Mountain National Park. The inside museum features interpretive exhibits and displays about the Native Americans and early settlers who lived in the area; while the outside area includes a collection of old buildings that were moved from the park. Cherrie had no problems wheeling around the inside, but she needed a little assistance getting around the pathways to the outside exhibits. Still, it’s a fun stop, and the good news is that they are making some access improvements to the outside area, which should be completed by Spring 2010. 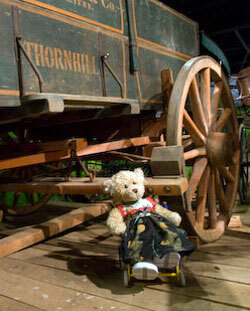 Cherrie at the Great Smoky Mountain Heritage Center. On the plus side, their amphitheater is very accessible, and they have some very reasonably priced concerts there. Check out their website for a complete schedule. They also have some fun events there. We were disappointed that we missed the rooster crowing contest and the ladies skillet toss competition. We also spent a good deal of time in the Smoky Mountain National Park, as it was very close to our cabin. There is no admission charge to the park, so we visited it several times. It’s a beautiful park — one that can be really enjoyed from a driving tour. Cherrie especially liked the Cades Cove driving loop. which features a good collection of historic buildings and some great fall scenery. Even though the historic buildings aren’t accessible (most have one or two steps) you can still get a good view of them from the outside. Cherrie also liked the Old Mill, which is located next to the Visitors Center. There is ramped access to this working grist mill, and you can even purchase a sack of corn meal that was made there. There are a number of other historic buildings around the mill, and although many have steps into them, there is good pathway access to most areas of the site. It’s a nice stop, and one of the more accessible places in the park. All in all we had a beautiful visit to the Smokies. The weather was very mild and the fall colors were just starting to come out. Cherrie really didn’t want to leave, but we had to head off to Nashville. I’m sure she’ll like that stop just as much, as she’s a huge country music fan. We all had a fun time exploring the area. Our first stop was at the Great Smoky Mountain Heritage Center, which features artifacts from the folks who previously lived in the Great Smoky Mountain National Park. The inside? museum features interpretive exhibits and displays about the Native Americans and early settlers who lived in the area; while the outside area includes a collection of old buildings that were moved from the park. Cherrie had no problems wheeling around the inside, but she needed a little assistance getting around the pathways to the outside exhibits. Still, it’s a fun stop, and the good news is that they are making some access improvements to the outside area, which should be completed by Spring 2010.On the plus side, their amphitheater is very accessible, and they have some very reasonably priced concerts there. Check out their websitefor a complete schedule. They also have some fun events there. We were disappointed that we missed the rooster crowing contest and the ladies skillet toss competition.We also spent a good deal of time in the Smoky Mountain National Park, as it was very close to our cabin. There is no admission charge to the park, so we visited it several times. It’s a beautiful park — one that can be really enjoyed from a driving tour. Cherrie especially liked the Cades Cove driving loop. which features a good collection of historic buildings and some great fall scenery. Even though the historic buildings aren’t accessible (most have one or two steps) you can still get a good view of them from the outside. This entry was posted in Traveling Cherrie by Candy B. Harrington. Bookmark the permalink.